Perhaps your scalp feels itchy, tingly, burning or throbbing. Scalp issues can be a serious problem, but usually they’re an easy fix. 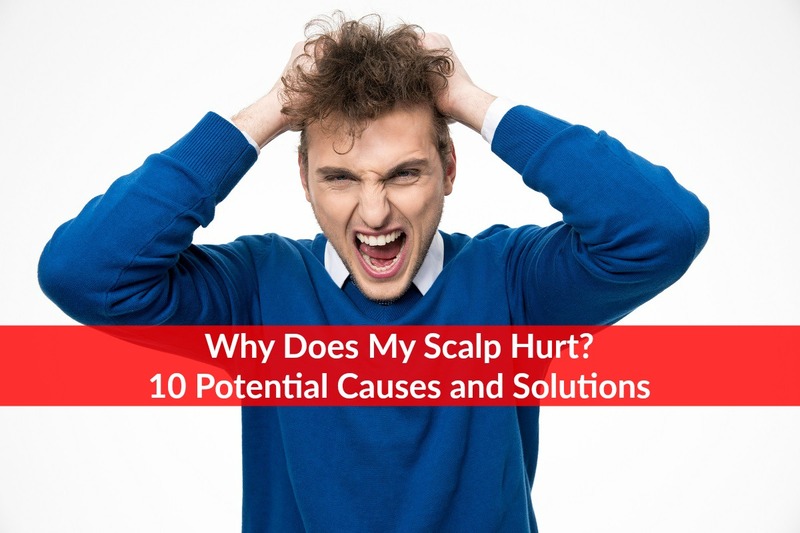 Scalp pain can be scary and uncomfortable, you might also feel scared that your pain could be the result of something serious, but there are a lot of simple reasons your scalp could hurt too. Find out why you might be experiencing pain of the scalp, can you treat your scalp pain on your own and when you should see a doctor. Eczema is a skin condition that affects thousands of people every year. It’s difficult to detect underneath the hair and can affect people in very different ways. You find your scalp starting to itch and burn. You can see blotchy red spots underneath your hair or along your hairline. You might start seeing these spots move south of your hairline as well. Your skin might start to feel rough and leathery. It could itch and burn intensely or just feel a little uncomfortable. You should see your doctor if you believe you have eczema. You might simply need to apply a heavy moisturizer to your scalp once or a few times a day or a special shampoo and conditioner. Your doctor might also prescribe steroid creams or treatments if your eczema is bad enough. Your scalp feels itchy and a little painful. You might even draw blood from scratching too hard. You can feel a small or even large bump on your scalp underneath your hair. Unfortunately, it’s hard to detect bites underneath the hairline. Luckily, the most bug bites are treatable. You might need to pay a trip to your doctor’s office to find out what kind of bug bite you have. Most bug bites are harmless, but some bites can be more serious. Certain spider bites need special attention. Zika has become a serious issue over the past few years. Ruling out these bites can curtail more serious problems. Your doctor will probably prescribe some kind of antihistamine to alleviate common bug bites. If the bites are more serious, you’ll need to take a regimen under your doctor’s supervision. Your scalp could feel itchy, and you might experience flakes of dead skin falling from underneath your hair. Many people experience dandruff in drier climates and during the winter months. Some people experience this issue year round. Dandruff is very treatable. You could use an over the counter dandruff shampoo, or your doctor could prescribe a shampoo that attacks your dandruff more aggressively. Your scalp might burn and sting. You might see blood flowing from underneath your hairline. The skin is tender to the touch. Most cuts and lacerations are very minimal and will close up on their own in a few days. Check with your doctor if your cut isn’t getting better. It’s often difficult to determine whether or not the problem is more serious. Also, it’s difficult to dress the wound since hair gets in the way. Keep your scalp as clean as possible, and don’t pick at the cut. Talk to your doctor if you believe the cut is serious. Your doctor might need to give you stitches or apply butterfly clasps to your skin to help it heal easier. Make sure you are doing everything you can to keep the area sanitary to prevent infection and further problems. Your scalp hurts, and your entire head might even be in a lot of pain. Perhaps you’re a little dehydrated or had too much to drink the night before. This is an easy fix. Headaches can be a serious pain in the neck, but they often go away on their own. Wait 30 or 60 minutes before treating a headache. Drink as much water as you can manage. Drink some Pedialyte if you feel you might be dehydrated. The longer you can wait the better. Sometimes headaches just refuse to go away. If this is the case, take an over the counter aspirin. Make sure you consult with your doctor before taking any over the counter medications that might interact with other meds. What you thought was a garden variety headache has morphed into an intense pain. You can’t see, your eyes are sensitive to light and you might even feel nauseous. In this case, you might have a migraine. Thousands of people suffer from migraines every year. Usually migraine sufferers experience these types of headaches on a monthly or annual basis. Drink plenty of water, and take an over the counter headache medication. Excedrin makes a special type of medication just for migraines. Often migraines are symptoms of a larger issue. Your doctor might even be able to find the source of your migraines and offer lifestyle changes to help you manage them. Perhaps you bumped your head in the past few hours or days. You might experience some swelling around the area. You could even see some discoloration around the affected area. A contusion is simple a bruised area of the body. Normally a contusion might not be cause for worry, but a contusion on the head could be a serious situation. Many contusions simply go away on their own. You should talk to your doctor immediately if you have a contusion of the head. These types of wounds can often lead to larger problems. You might have bumped your head or experienced an injury to your skull in the past few hours. Your head feels a little swollen and might show signs of redness or bruising. You feel a little sleepy, or you feel like you’re forgetting simple things. Go to urgent care right away if you are experiencing any of these symptoms! Concussions are usually treatable; leaving a concussion untreated could lead to grave conditions. Tell the nurse at urgent care your symptoms. You’ll probably be put under doctor supervision to ensure there isn’t more serious brain trauma. You probably have experienced some sort of blow to the head recently if you’re experiencing pain due to a fracture. The area is probably swollen and tender. You could experience some redness, discoloration around the affected area or bleeding from the ears or nose. A skull fracture occurs when the cranial bone breaks. You should seek medical help immediately if you feel you might have a fracture. An untreated fracture can lead to very serious problems. Your doctor may take x-rays and even perform surgery to fix a fracture. You might experience a lot of pressure in your skull, and your doctor will take steps to ease this pressure. A sharp pain in your scalp might be keeping you up at night. Many people with Fibromyalgia experience these symptoms but are able to lead normal lives thanks to new treatments. You might have gone through some life changes recently. Many people with this condition have experienced added stress in their lives. For some it’s a death in the family. Others might have experienced a promotion at work. Some people with Fibromyalgia say that they feel overwhelmed with the everyday tasks of life. There are many treatments for Fibromyalgia you can perform at home. One of the biggest causes of this condition is stress, so taking it easy is the first step to managing Fibromyalgia. Patients find exercise, epsom salt soaks and decreasing caffeine can also help. Talking to a therapist is one of the best ways to manage this condition. Many sufferers of Fibromyalgia comment that they feel better just being able to unload some of the stresses of life. This condition often has a stigma attached to it that can make dealing with the pain even more difficult. Some people claim that Fibromyalgia isn’t real and is simply made up by people who don’t want to deal with stressors. Talking to a therapist can help you feel in control of your life and your Fibromyalgia. Your doctor may also prescribe medication to help you manage this condition as well. Scalp issues can be serious, but they are almost always treatable. If you feel that you have a health problem with your scalp or head, it’s always best to contact your doctor to rule out any serious conditions. Since your brain is so closely linked to your scalp, you want to take extra care to ensure that problems don’t worsen.